Skipper Ian Bell recorded a composed unbeaten 128 as England A reached 272-4 at the close of the first day of their three-day tour match with Sri Lanka A. Having lost the toss, Bell arrived at the crease in the third over, after Michael Powell was dismissed for seven. The captain shared 116 with Alistair Cook, who made an assured 63. Owais Shah added 52 and though Rikki Clarke fell for just four, Bell kept his focus throughout and struck 11 fours and a six in his 269-ball knock. Bell took full advantage of a weakened Sri Lanka attack, blunted by several injuries and a flat wicket ideal for batting. 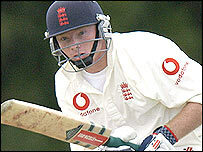 First Kevin Pietersen, and now Ian Bell impressing. Are the death knells sounding for Mark Butcher's international career? The Warwickshire strokeplayer showed great patience on a roasting day in Colombo, offering no chances throughout his innings. Spinners Mohamed Suraj and Malinga Bandara gave their team some hope late in the day with the wickets of Shah and Clarke. Shah was lbw playing across the line and Clarke was caught at short-leg but Bell remained in command. The England A squad flew to Colombo after completing a 4-0 win in a one-day series in the UAE on Saturday. Sri Lanka A: J Mubarak (Capt), S H T Kandamby, D A Gunawardene G I Daniel, M M M Suraj, A S Polonowita, C M Bandara W M G Ramyakumara, H A P W Jayawardene (Wkt), M T T Mirando P N Ranjith. England A: M J Powell, A N Cook, I R Bell (Capt), O A Shah A P R Gidman, R Clarke, M J Powell (Wkt), G P Swann, D S Harrison S I Mahmood, J J B Lewis.